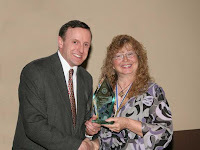 This past February I was awarded the 2008 Wedding Album Photographer Award for the state of Maryland. The award is based on the cumulative points total from four print competitions that took place during 2008. We participated in 3 of the 4 competitions and in each case we won the best of show award and the first place award. Co-Chair of the MDPPA print competition. The award ceremony took place at the end of the Annual Convention of the Maryland Professional Photographers Association which was held in the Sheraton Hotel, Columbia, Maryland. This was a wonderful 4 day convention and featured some of the best photography instructors in the country. I was very fortunate to meet and befriend Jim Lersch of Nixa, Missouri. Jim presented two great seminars - one covering High School Seniors and the second dealing with Commercial photography. The amazing images presented during both seminars have certainly helped inspire me to further improve my own photography. You can check out Jim's site here. Also at our convention was a marvellous portrait photographer, Don Chick, from East Rochester, New Hampshire. He presented a great program on portrait lighting to a packed room. Samples of his wonderful work can be found here.